One of our lovely twitter followers suggested this breakfast dish and it’s been at the back of my mind ever since. 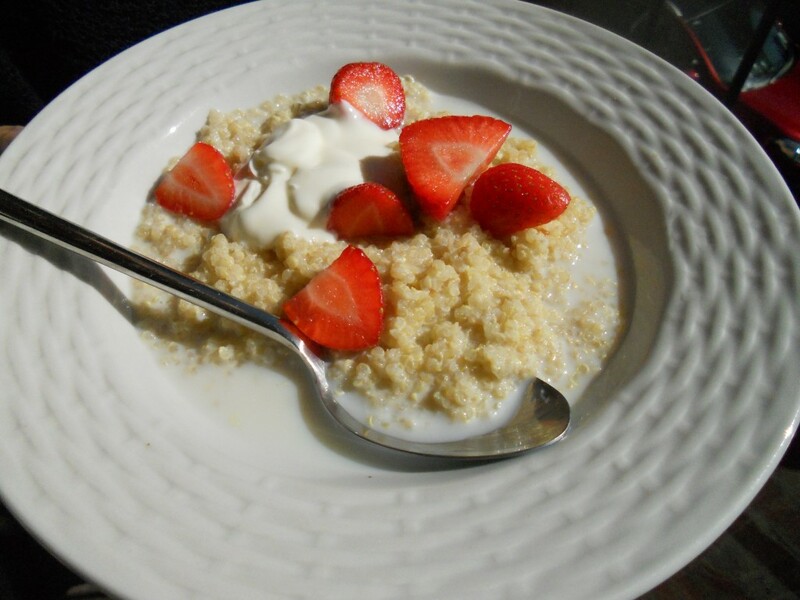 We are big fans of quinoa, loving its blend of protein, iron and micronutrients. The UN like it so much they’ve named 2013 ‘International Year of Quinoa’ – pretty high accolade for such a teeny grain. The day before a race seemed like the perfect time to give it a go – great for stocking up on those all-important carbs to fuel us. We’re glad we tried it – it’s delicious! A bit of Greek yogurt added some extra protein, and me being me, I couldn’t resist some tahini on mine. We won’t be having this for breakfast before the Edinburgh Half Marathon, though. Our breakfast of choice on race day is granary toast with jam, having a bite or two of banana if we’re hungry closer to race time. More milk/’milk’ to serve and any of your favourite porridge toppings – nuts, berries, agave, honey, prunes, greek yogurt etc. 1. Rinse quinoa thoroughly, then put in a pan with the liquid and bring to a gentle simmer. Cook until the grains are puffed open and quite soft to the tooth. This takes about 20 minutes, give or take. Serve with your toppings of choice.